The new edition of BoardSource’s core resource, Ten Basic Responsibilities of Nonprofit Boards, reinforces the expectation that nonprofit board leaders step outside the boardroom and advocate for their missions. An all-time bestseller, this book not only explores the board’s 10 core responsibilities, it also puts them into the context of the governance challenges facing nonprofits today. 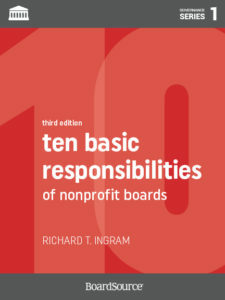 Author Richard T. Ingram expands upon the expectations and recommendations within each of the ten responsibilities, with the most significant and notable changes reinforcing the active and engaged role that BoardSource encourages board members to play as advocates and ambassadors. Here are the highlights. Chapter one is focused on the role that the board plays in defining the fundamental purpose and mission of the organization. it sets the tone early that board members’ responsibilities go beyond the internal work of the board, and require a public role. In chapter six, which summarizes the role that board members play in ensuring that the organization has the resources it needs to sustain its mission, there is an additional section focused on public/government support. It mentions the role that board members play in educating policymakers about the need for — and impact of — those dollars through advocacy. In discussing the external role that board members play in building and supporting their organization’s reputation and reach with key constituents and the general public, chapter ten begins with a section on advocating for your mission and the unique and important role that board members play in accelerating the advocacy efforts of their organizations. The third edition of Ten Basics is a must-have resource for board members. Want to learn more about why we think board engagement in advocacy is so essential? 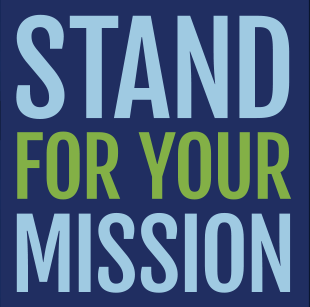 Anne Wallestad shares her thoughts on why we formalized the expectation that advocacy is a key board responsibility in the newest edition of Ten Basics. Read the Nonprofit Quarterly article.